4 | 90 students enrolled. 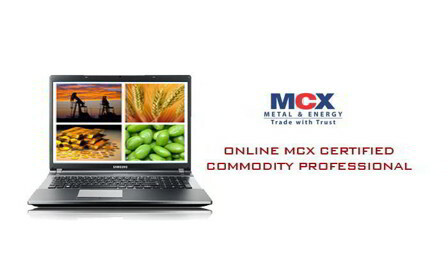 Online MCX Certified Commodity Professional (MCCP) programme is for those who want an exposure in the commodity derivatives market. This programme emphasizes on the techniques of trading in commodity markets, its operations and practices, clearing, settlement and delivery procedures, and its regulatory and legal framework. After the successful completion of the programme, a candidate becomes eligible to obtain ‘MCCP’ or ‘MCX Certified Commodity Professional’ certificate. Students who enroll for this MCCP course would avail of comprehensive study material and an exhaustive question bank that would aid in the preparation process. This MCCP course is well equipped with 4 modules and test to provide detailed knowledge on commodity markets and related aspects. Students enrolling for this programme will be given a “Certificate of Participation” from MCX facilitated by Elearnmarkets.com, after successful completion of the course. Participants will also be given free access to related webinars conducted by Kredent Academy for further knowledge enhancement. An email query support, Question & Answer community platform can also be availed by the student for any kind of doubt clearance related to content while pursuing the MCX Certified Commodity Professional course. The student needs to register with MCX by clicking here. On registration, MCX sends a soft copy of MCCP book to the student directly. The students will mail to sandeep.kalambate@mcxindia.com providing their preferred date and location from where they will take the examination. The examination has to be taken within 3 months from the date of enrollment. Note: The course fees does not include the MCX examination fees.